The Tuff Canyon trail is located in the Cerro Summit Recreation Area near Montrose, Colorado. The trail begins off of the Elk Run trail where it climbs a draw that leads up to the Porcupine trail. To get there follow Highway 50 east toward Gunnison from Montrose for about 10 miles to the top of Cerro Summit Pass where the recreation area will be on the right hand side of the road. There are two places where the Tuff Canyon and Elk Run trails both meet that are within a hundred feet or so from each other. This post begins at the second one that is about 400 feet from where the Elk Run trail departs from the Meadow Loop. The trail starts out climbing around the shoulder of the hill. The elevation profile shows how the trails 129 feet of elevation gain is spread out over its course with only a few minor drops along the way. The mountainside is covered with a thick growth of oakbrush that keeps it mostly secluded from other nearby trails. Even in the places where the oakbrush thins out there is still limited visibility for the trail in front of you. For mountain bikes heading in the downhill direction a few of the boulders provide an optional feature. Near the top of the hill the trail passes through a pleasant grove of taller oakbrush. Before reaching the half mile point Tuff Canyon meets up with the Porcupine trail and comes to an end. From here it is only about 250 feet the rest of the way up the Porcupine trail to the upper trailhead. On the day that we took the photos for this post we hiked the Tuff Canyon trail in both directions as an out-and-back. Going in the downhill direction the views of the surrounding area are more noticeable. For mountain bikers the Tuff Canyon trail would be easier, of course, going in the downhill direction. Going in the uphill direction the entire trail should be rideable and make for a pretty decent workout. 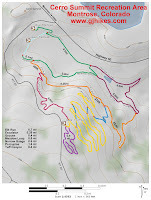 By combining Tuff Canyon with part of the Elk Run trail and either the Escalator or Porcupine trails will make a loop that comes out to right around 2 miles. 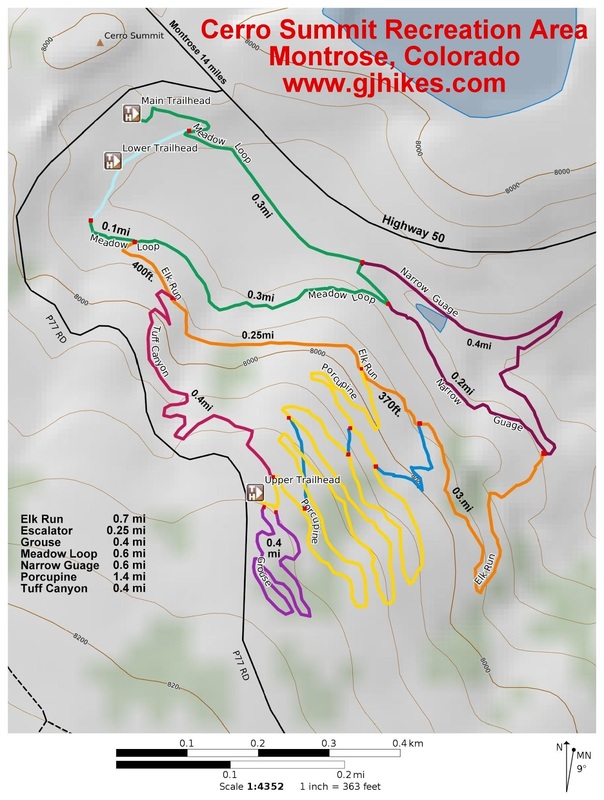 The Escalator and Porcupine trails are much easier in the uphill direction than Tuff Canyon. However you decide to do it the Cerro Summit trails are a good destination for a little summertime fun. If you would like to see it for yourself then all you have to do is 'Take a hike'.